The issue opens with Amethyst talking to Citrina about all the events she’ll never be able to experience. “You stole everything from me, witch-mother!” You stole my whole life! You know I’ve never had a real boyfriend, Citrina? And I’m never gonna have a sweet sixteen party, or stay up all night on New Year’s Eve! I’m never gonna go to high school now, not to mention college or law school!” Amy goes on to mention that she’ll never get married, have a baby or see Bruce Springsteen in concert. Amethyst is perched on a boulder in limbo communing with Citrina’s spirit. Citrina says that she did what she had to do, and even if Amethyst hates her Citrina will love her. Amethyst realizes that the nightmarish visions she’s been having are of her own future. She says “Oh, Citrina how can you ask me to do this?” She’s pulled back to the Gemworld. 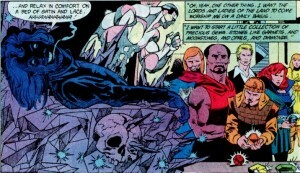 The Child celebrates chaos’ victory over the Gemworld and fantasizes about the Gemworld nobility visiting him to pay tribute. Amethyst interrupts him, saying that the Gemworld will always be hers. She fights Flaw, telling him to hit her with everything he’s got because she’ll make him pay for what he did to her father and Taffy. On Earth Herb Winston sees that his wife has knocked herself out with sleeping pills. He pours himself a cup of coffee and picks up the phone to break-up with his girlfriend. Amethyst struggles while fighting Flaw. Amethyst returns to The Child and White Opal. When the Child realizes what she did to Flaw he frantically tries to bargain with Amethyst. Amethyst absorbs The Child into the Gemworld. White Opal is horrified, but she says “The Gemworld is safe at last. I can see its future, White Opal. It is a good one, a happy one. 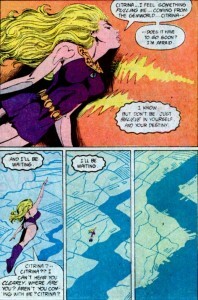 I’m glad to have helped it come to pass.” Amethyst says good-bye and a panel fills with radiant light. White Opal thinks that he’s witnessed a miracle. He wishes that he had a chance to tell Amethyst that Citrina visited him and she spoke of what she was doing to Amethyst. They were both sorry for the responsibility that was forced on her and thankful for Amethyst’s existence. Lord Garnet looks out the window of a castle. A Diamond Priest approaches him and comments that it is a beautiful morning, and a befitting day for the ceremony. 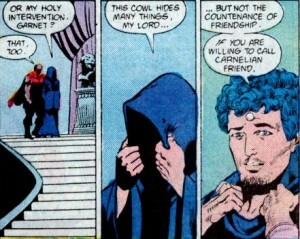 Garnet says nothing and the priest says “Why do you not answer me, my lord? Let me hear of your problem.” Lord Garnet says that he’s not in a confessional. 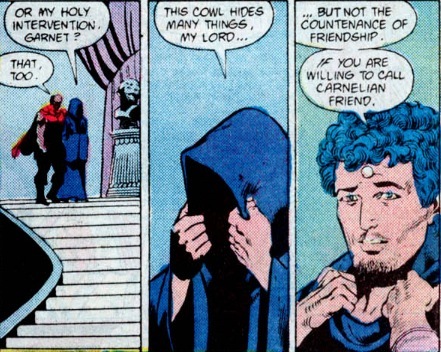 The priest says that the cowl hides many things, but not the face of friendship if he is willing to call Carnelian friend. Topaz greets Garnet and Carnelian. He has had a bit too much to drink. Garnet and Carnelian decide to join in. Turquoise is not surprised that everyone is getting plastered because Garnet got drunk before his own wedding. Carnelian begins the ceremony with much hiccuping. Isn’t it nice that the spirit of Dark Opal decided to lurk in a menacing manner around the wedding ceremony? I miss Dark Opal. On Earth, Emmy dreams of the Gemworld and her best friend who was a princess. A picture on the nightstand of Emmy and Amy slowly dissolves into a purple puddle. And that’s it! Amethyst sacrifices herself to save the Gemworld, her Earth family has their memories wiped, and while the Gemworld nobility remembers her fondly it doesn’t stop them from marrying each other and getting drunk. Rather anti-climactic, don’t you think? 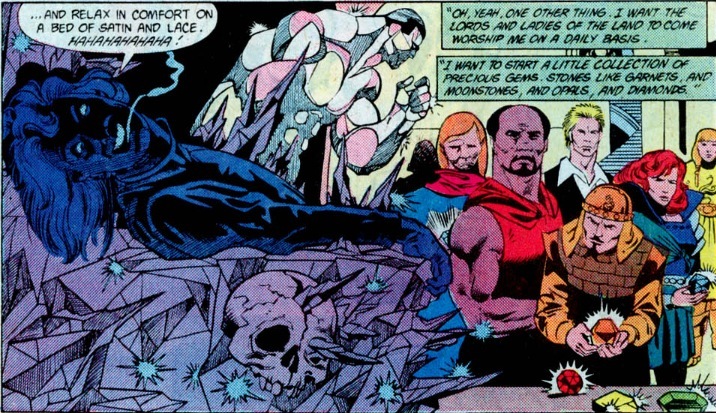 If you’ve been reading this series of posts thanks for sticking it out, and I’m sorry for taking so much time to get through the second Amethyst series. 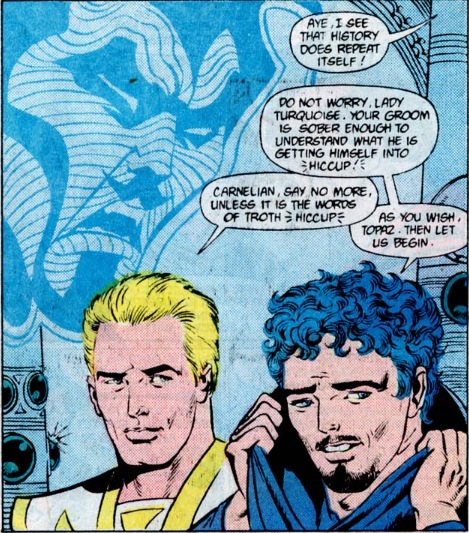 In the future I’m thinking of taking a look at the 1987 mini-series or exploring some of the times Gemworld related things popped up in the Legion of Super-Heroes next, so let me know if you’d like to see posts on either of those topics! 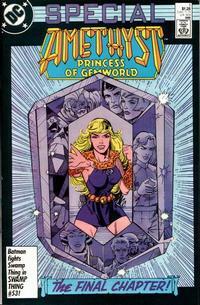 This entry was posted in comics and tagged Amethyst Princess of Gemworld on 6/1/2009 by Anna.